Personally I find it hard to resist any food that is stuffed – especially if there are mushrooms, artichokes and Parmigiano Reggiano involved! You’ll love this stuffing in pork chops, a whole chicken and boneless chicken breasts, but I like it best in a bone-in chicken breast with the wings still attached. Bone in breasts cook up more moist than boneless, and then there’s all those bones to gnaw on, the best part! Roasting and serving single meats their own little pan makes them extra special! To get wing-on chicken breasts, ask one of our butchers to cut or quarter a whole chicken, leaving the bones in and the wings on and packaging the legs separately. The legs can be saved for another use (like oven fried chicken or the world’s best chicken soup! ), but I usually just roast them alongside the breasts and serve them the next day in any number of ways (soup, salads, sandwiches, in BBQ sauce, etc). Cut pockets in the chicken breasts on the rib side, cutting from under the wing and along the rib cage – one of our butchers would be glad to do this for you.Sauté onion and shallots in olive oil until softened and lightly browned. Add mushrooms and continue to sauté until soft. Add chicken stock or wine and bring to a boil, reducing slightly. 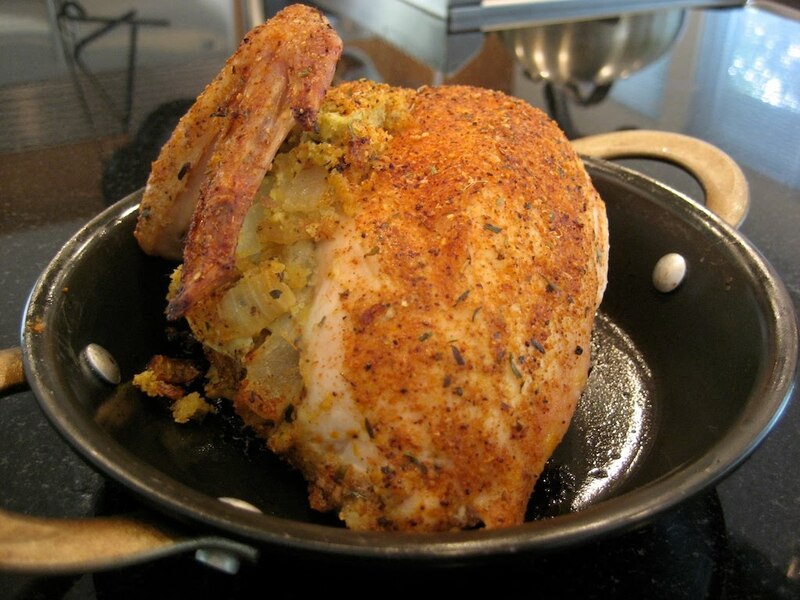 Add artichoke hearts, breadcrumb and Parmigiano and season to taste Tony’s Tuscan Grill Rub, or your favorite blend. Transfer to a bowl and cool a bit, and then stir in beaten egg. My favorite chicken stock base. Notes: For rich low sodium chicken stock, I suggest More Than Gourmet Glace di Poulet (roasted chicken stock) reconstituted with 2 cups water rather than the four cups the package calls for. This brand of stock base is not salty and tastes great this way, other brands would probably turn out very salty.